This week I am featuring Amanda Phillips, who is very passionate about all things health, wellness and fitness. Amanda runs the website Gorgeous Presence where she helps and inspires professional women to live a balanced and happy life. Something that I constantly striving for. I hope you enjoy my interview with Amanda. I live in Cronulla (Sydney’s southern beaches) with my husband (we got married in early 2015!). It is such a beautiful, healthy and family-oriented community. I don’t think I could ever move away from the beach – it really is the perfect to enjoy being outside in the fresh air, especially on the weekend. For as long as I can remember I have had a interest in health and fitness, participating in activities such as netball and athletics during my school years. I wasn’t exceptionally talented at sport, but I was extremely determined! I really think this determination has carried through to my adult years, because I now have an absolute passion for sport. It wasn’t until a couple of years ago that I really took an active interest in learning more about holistic health, including the importance of mindfulness, meditation, hormones and the impact of stress and foods on the body. Working in the corporate world for over a decade, I could see the impact of stress and poor nutritional habits on my body, so I knew I had to make some changes before the stress impacted on my health. I have learned so much from reading and following wonderful role models, such as Alice Nicholls from The Whole Daily, Dr Libby Weaver, Melissa Ambrosini and Lorna Jane Clarkson, that I started my own website called Gorgeous Presence to inspire other professional women to live a balanced, joyful and healthy life. There is just so much information about holistic health out there on the internet that it becomes overwhelming if you don’t know where to start. My hope is that Gorgeous Presence takes the stress out of becoming healthy for busy women! Don’t overwhelm yourself with too many changes at once! I love Alice Nicholls’ suggestion in her Life Transformation Project e-Course to “crowd in” the good things into your life rather than adopting the negative mindset that you have to eliminate the bad stuff. For example, if you want to improve your eating habits, try adding more whole foods such as fresh organic veggies, local free range meats and whole grains. The more of these good foods you include in your meals, automatically the bad foods are forced out of your diet without you even being conscious of it. The same applies to exercise – if you want to increase your exercise levels during the week, include activities that you find fun, such as dancing, a team sport or a yoga session. Exercise doesn’t need to feel like a chore! Supermarkets are becoming more health-friendly, with great ranges of organic produce and fresh meats at reasonable prices. Make friends with the outer aisles of the supermarket where all this fresh produce is hidden. Gone are the days when you had to visit a health food store and pay ridiculous prices for organic food! For cheap and easy meals, you can’t go past a slow cooker. Did you ever receive one as a gift and have never used it? Pull it out of the box immediately! I love going to Woolies to pick up a marinated Aussie lamb from Jamie Oliver’s range, or if I have more time, I will visit my local butcher and select a roast lamb, pork or beef to season myself with fresh herbs and edible essential oils. On Sunday mornings I will add the lamb or meat into my slow cooker with some organic sweet potato, zucchini, carrots, cauliflower, etc (whatever takes my fancy on the day!). By dinner time the house smells amazing and there are normally leftovers for weekday lunches! I also try to buy fresh foods for meals as I go, because then I don’t end up throwing things away because I haven’t had time to use them throughout the week. This saves a lot of money and I can alter my meals to suit how my body feels on the day. The key is to keep foods simple, including any seasoning or sauces you add. When I first met my husband, he was used to his family’s cooking style and was reluctant to try different flavours. I slowly but surely changed his eating habits by adding new foods and flavours gradually. To make things easier, I normally decide what to cook and simply ensure that there is a variety of veggies so that my husband can choose to eat more of his favourites but also try out new things of his own accord. Generally he is happy to try new things after a little bit of encouragement! I have no doubt this technique could be used on children as well! Wow, this is a hard one to answer for a food lover! My favourite food would have to be eggs. I have them every morning for breakfast in a wrap, omelette or poached on toast. They keep me full until lunch, and can be used in so many ways. I have a few! I love Alice Nicholls from The Whole Daily, Pete Evans, Lorna Jane Clarkson and Sarah Wilson from I Quit Sugar. They all create recipes which are simple to make and full of delicious, whole foods. I definitely prefer to follow foodies who are realists with their approach to cooking, because who seriously has the time to create gourmet meals with dozens of ingredients these days?! I love going to Bikram yoga or taking a walk by the beach. Both keep me feeling centered and calm. I also love to research health and wellness topics on the internet, including listening to podcasts and doing e-Courses. Call me a nerd, but I love to learn new things! Today, I am sharing my recipe for my healthy raw “cheesecake”. Press mixture evenly into the bottom of a round springform cake tin greased and lined with baking paper. Place in freezer until the filling has been prepared. Blend all ingredients, except the blueberries, in a food processor until smooth. Gently fold the blueberries into the mixture with a wooden spoon. Pour mixture over the top of the base and spread evenly. Press extra blueberries and cacao nibs onto the top of the cake for decoration. Set in fridge for 4 hours. You can modify the recipe in so many ways by adding different fruits, swapping the peanut butter for a chocolate swirl made with cacao powder and cacao butter. It really is that easy to make a healthy and delicious dessert! 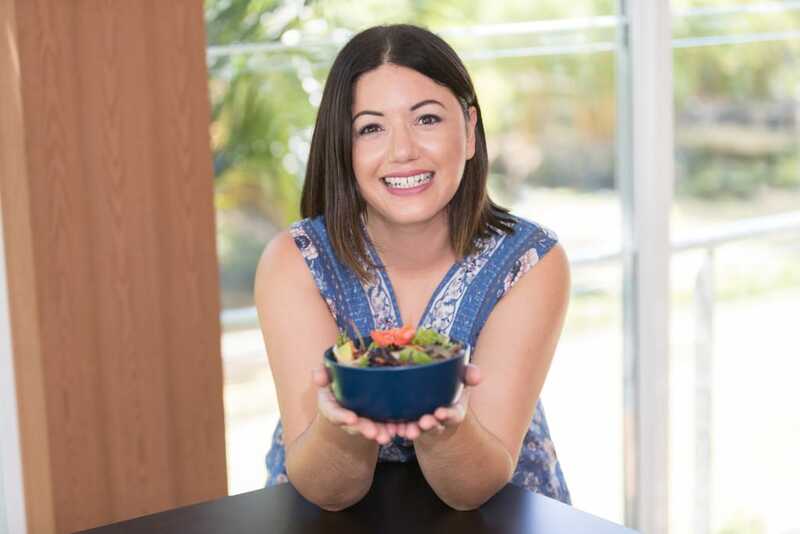 Amanda is on a mission to inspire professional women to live a balanced, joyful and healthy life. An accountant in the busy corporate world, Amanda knows first-hand the challenges women face to prioritise their wellbeing and she is passionate about changing this mindset. Amanda proudly admits that she is a Lorna Jane addict and is dedicated to the Move Nourish Believe philosophy. When she’s not in the office, Amanda can be found lifting weights in the gym, practising sweaty Bikram Yoga, taking walks by the beach with Cindy the Dalmatian, photographing everything and anything, trying new healthy recipes and dreaming of holidays in Bali. Amanda writes at Gorgeous Presence where she shares practical advice inspired from her very own health and wellness journey. You can connect with Amanda on Facebook, Instagram, Twitterand Pinterest.